Submit your essay or personal statement for proofreading, line editing, or a Four-Point Review from one of our writing specialists! We can also shorten essays to fit into word limits! Proofreading: we fix errors in punctuation, spelling, grammar, and usage. Proofreading is 4 cents per word, rounded to the nearest dollar ($26 for a 650-word essay). Four-Point Review: get feedback on the structure, tone, content, and mechanics of your essay. Essay shortening: We will shorten your essays to fit within specified word limits. Essay shortening is 50 cents per word ($50 to shorten a 750-word essay to fit into 650 words). No consultation needed! 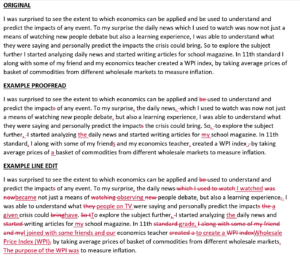 Comprehensive editing: A “workover” of your essay which may include restructuring paragraphs and removing unnecessary content. There is no set price; you must submit your essay for a quote. Prices range from $75-$150 for a 650-word essay. Consultation: Schedule an appointment to speak with a writing specialist! Turn-around time: 24 hours or your money back! What’s the difference between a proofread and a line edit? When you submit your essays for proofreading, we fix errors only. We don’t adjust sentence structure or make any adjustments to word choice unless usage or spelling is wrong. 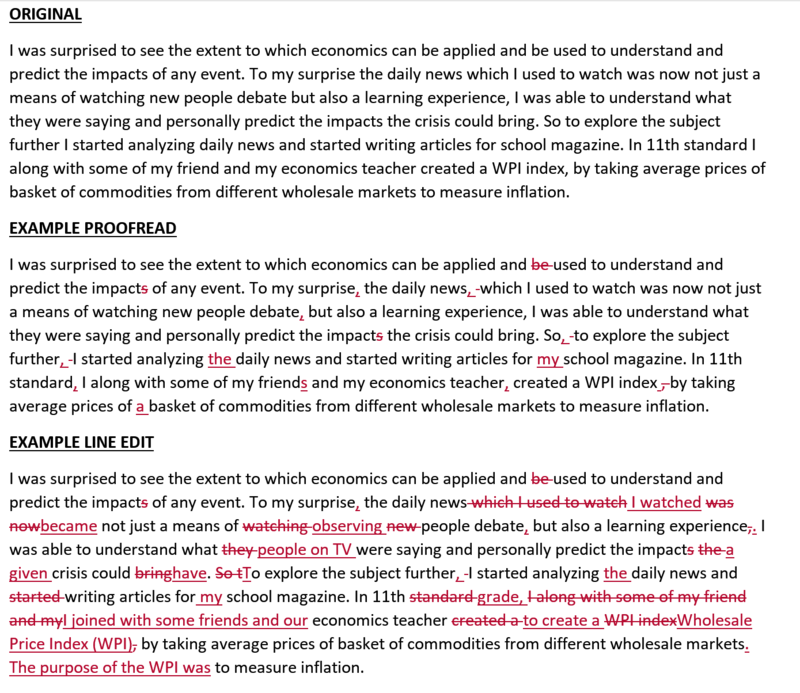 Click here or on the image below to see an example passage with both a proofread and line edit applied. What does a Four-Point Review cover? Tone: The degree of formality as well as the emotions and attitudes both expressed in your essay and potentially elicited in the reader. Content: The subject matter and details that belong and don’t belong. Mechanics: Spelling, grammar, usage, vocabulary, punctuation, and sentence structure. No-plagiarism pledge: Our submission system is encrypted and we will never share your essay with anyone other than our trusted IvyAchievement management team, specialists, and consultants.